Mary Anna Evans , Findings. Mary Anna Evans has degrees in physics and engineering, but her heart is in the past. Her series character, Faye Longchamp, lives the exciting life of an archaeologist, and Mary Anna envies her a little. 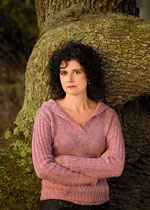 Her first novel, Artifacts, won the Benjamin Franklin award for best mystery published by a small press. It also won the Florida Historical Society's Florida Literature Award, and it was named by the Voice of Young America (VOYA) as an "Adult Mystery with Young Adult Appeal." Mary Anna is proud of being recognized for writing a page-turner for people of all ages while, at the same time, getting the historical facts right. Her second novel, Relics, was an Independent Mystery Booksellers Association (IMBA) bestseller, and it was nominated for the Southeastern Independent Booksellers Alliance's SIBA Book Award. Her third novel, Effigies, was named a Book Sense Notable Book. Mary Anna turned from engineering to fiction after the birth of her third child, prompting a shift in focus from managing hazardous wastes to preparing balanced meals. She has yet to acquire the knack of laundry management. Mary Anna Evans is a LibraryThing Author, an author who lists their personal library on LibraryThing. Mary Anna Evans's book Isolation was available from LibraryThing Member Giveaway. Mary Anna Evans's book Wounded Earth was available from LibraryThing Member Giveaway. Mary Anna Evans is currently considered a "single author." If one or more works are by a distinct, homonymous authors, go ahead and split the author. Mary Anna Evans is composed of 2 names. You can examine and separate out names.